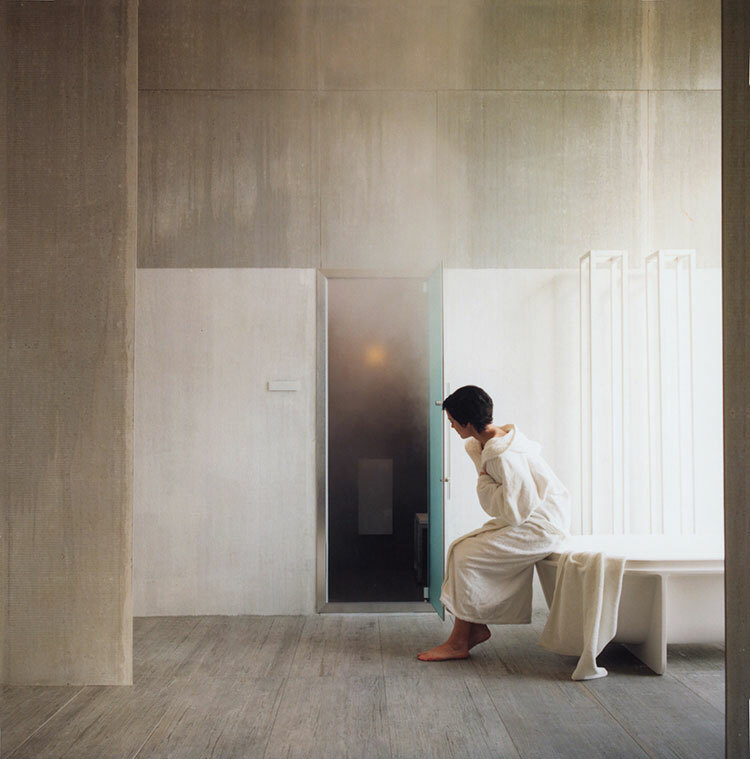 From Turkish baths to expansive luxurious saunas, effegibi delivers perfect well-being by combining state-of-the-art technology with craftsmanship traditions. 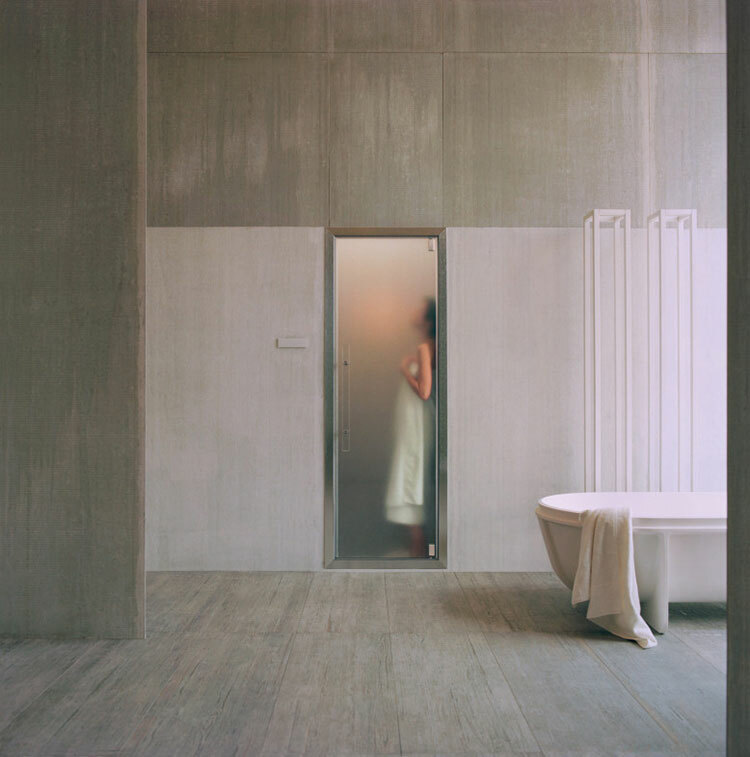 For over twenty-five years, Effegibi has been designing and manufacturing saunas and Turkish baths with state-of-the-art technology that are 100% Italian, from design to manufacture. They pride themselves on their use of only eco-friendly materials, with no plastic and the wood is always top quality from reliable sources that do not cause deforestation or endanger rare trees under threat. Effegibi are fully aware that feeling good equates to looking good which is why they take just as much care over aesthetics. What is the main difference between a sauna and a Turkish bath? The main difference can be found in the effect they have on our body. 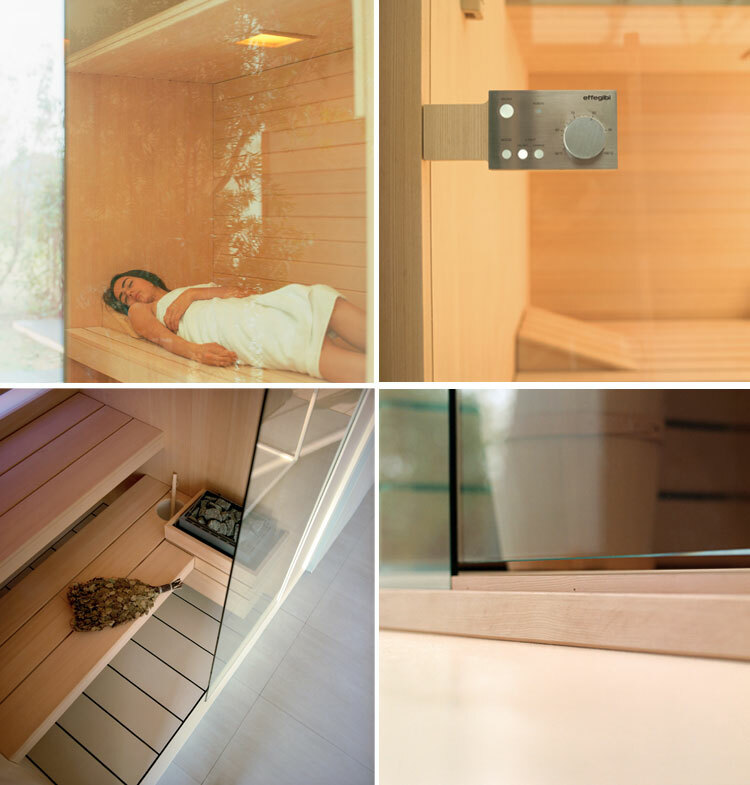 Finnish saunas, for centuries is a truly purifying ritual, today offer an excellent way of obtaining achieving all-round detoxification, purification and elasticity of the skin, thanks to the positive effects of very hot and dry air. This heat bath is particularly recommended for anyone wanting to relax and get rid of the stress of their everyday lives, but it is also great for people who play sport: it actually helps recovery, preparing the muscles for effort. Thanks to their natural ability to relax the muscles, Finnish saunas are the ideal remedy to relieve localized conditions such as muscular or osteoarticular traumas. 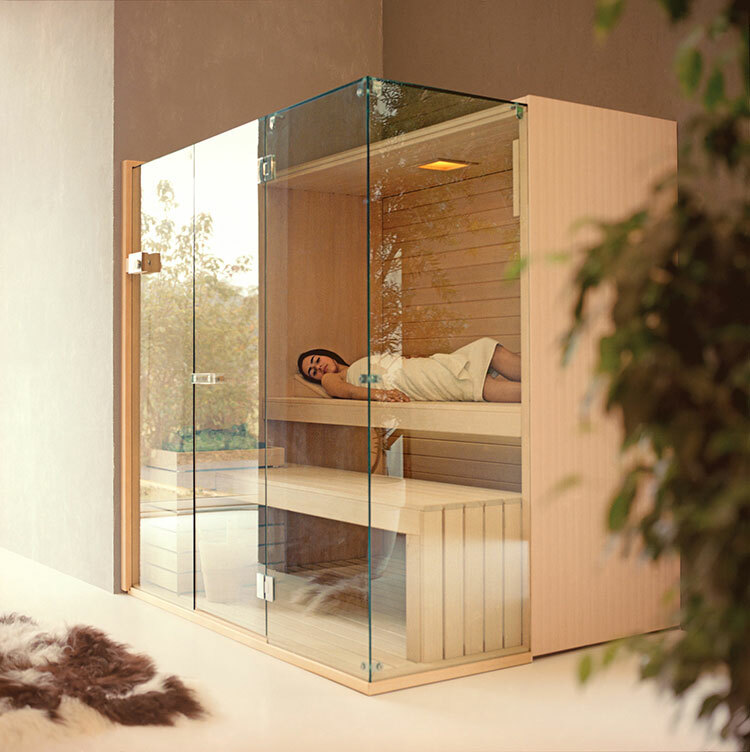 A bio-sauna, on the other hand, is a sauna with a temperature of between 50 and 60° C and humidity of around 60-70%. Thanks to its built-in vaporizer, if you set your preferred temperature, the bio-sauna stove creates the perfect balance between heat and humidity. 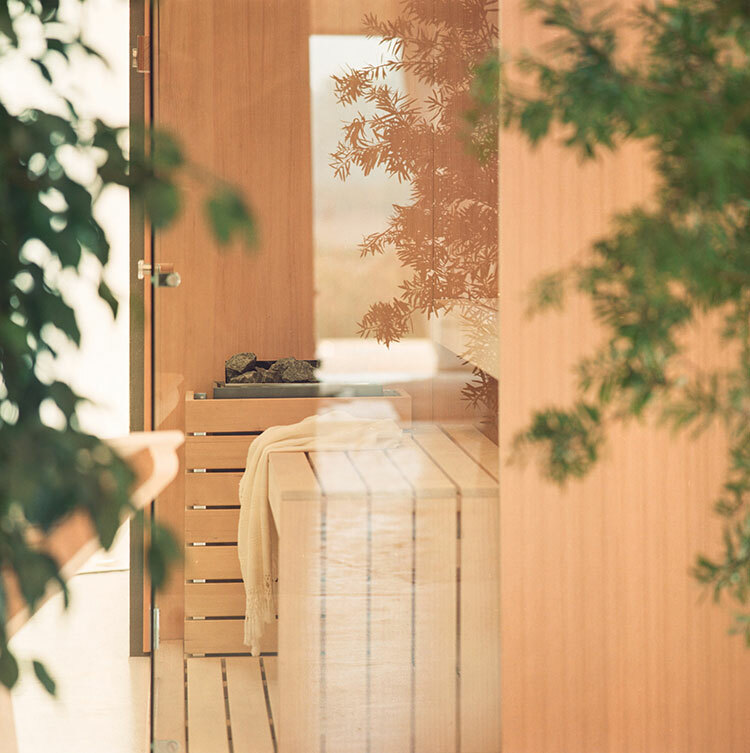 The combined Effegibi system lets you choose between a bio-sauna, a halfway house between the Finnish sauna and the Mediterranean nature of the steam bath, or a traditional sauna with low humidity and a temperature of up to 100 °C. 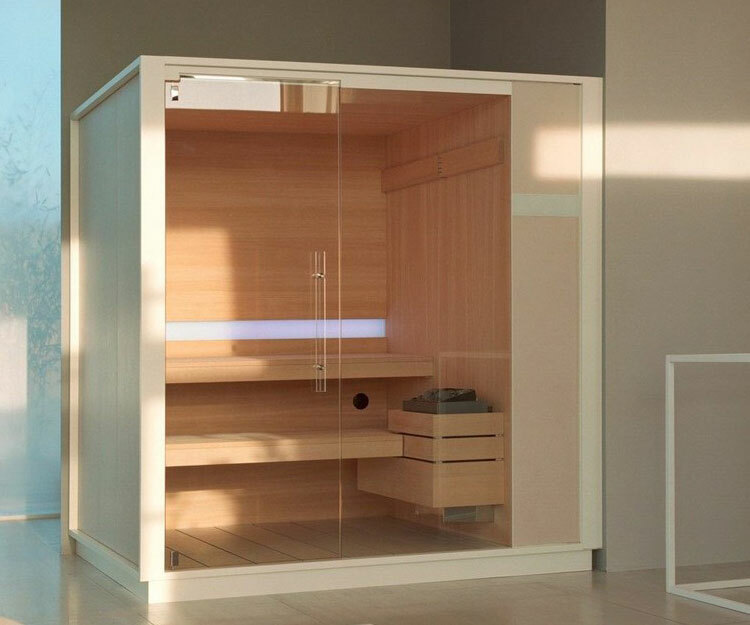 A sauna with extremely versatile design features, with wide glass panels reaching right up to the ceiling that create a light and airy feel that is perfect for any environment. 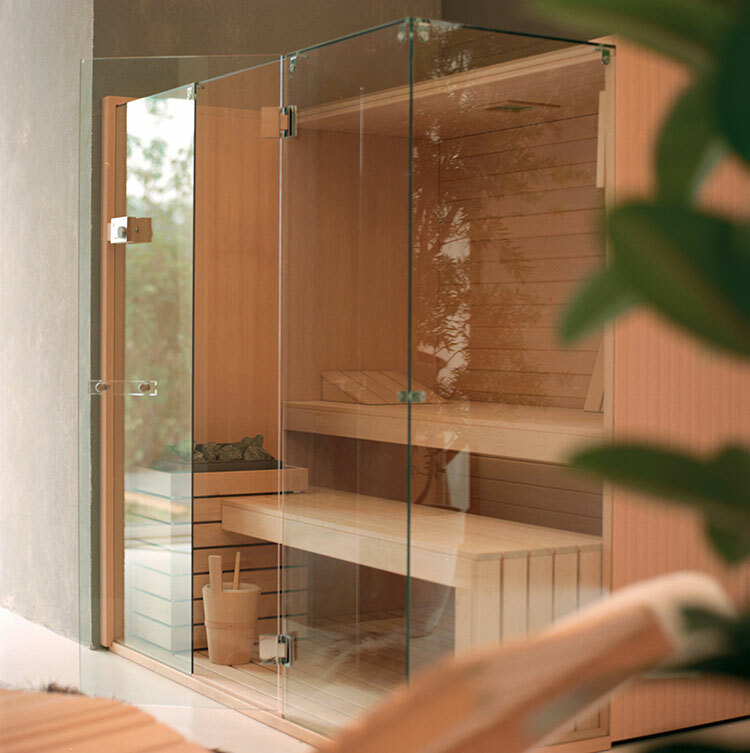 Certified sauna made of prized Canadian hemlock wood and 10mm toughened glass panels. The glass front wall, door and ceiling give Sky an extremely light, airy look. An ESS – Effegibi Sound System, delivers music from your own device can be added to any model. All of three stocked SKY models have a 2-3 week lead time. If one of these stocked models doesn’t fit your spacial needs, Effegibi is happy to accommodate with a custom design. Much like it’s cousin, with more generous glass surfaces, it’s a corner radiating light and wellbeing. 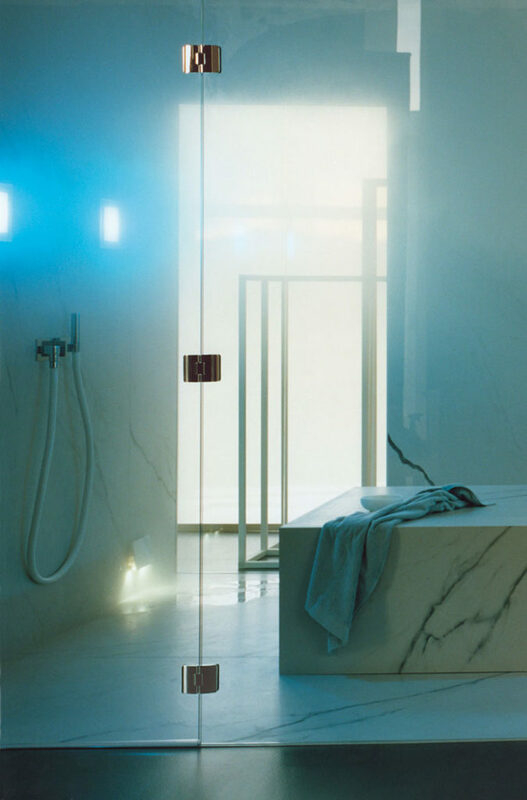 The larger glass surfaces emphasize the design features of this line. The Sky Corner interior can be enhanced with colour therapy and under-bench LED lighting. Made of prized Canadian hemlock wood and 3/8” toughened glass panels. Extremely generous glass surfaces: front wall, door, ceiling and side wall. Extremely versatile, ideal for made-to-measure solutions. 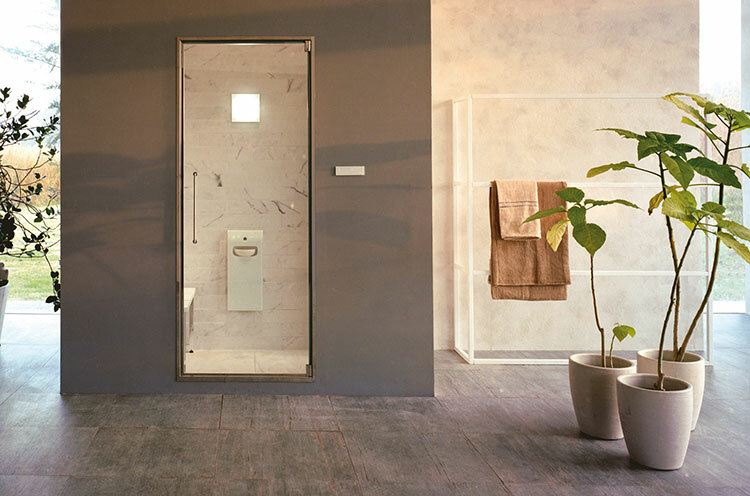 Its the advanced technology of the ‘nuvola smart power steam generator’ that enables effegibi to create sauna and hammam sanctuaries even in the smallest of spaces. The ‘touch&steam’, ‘aquasteam’ and ‘easysteam’ systems each define a different yet extremely powerful and functional generator. 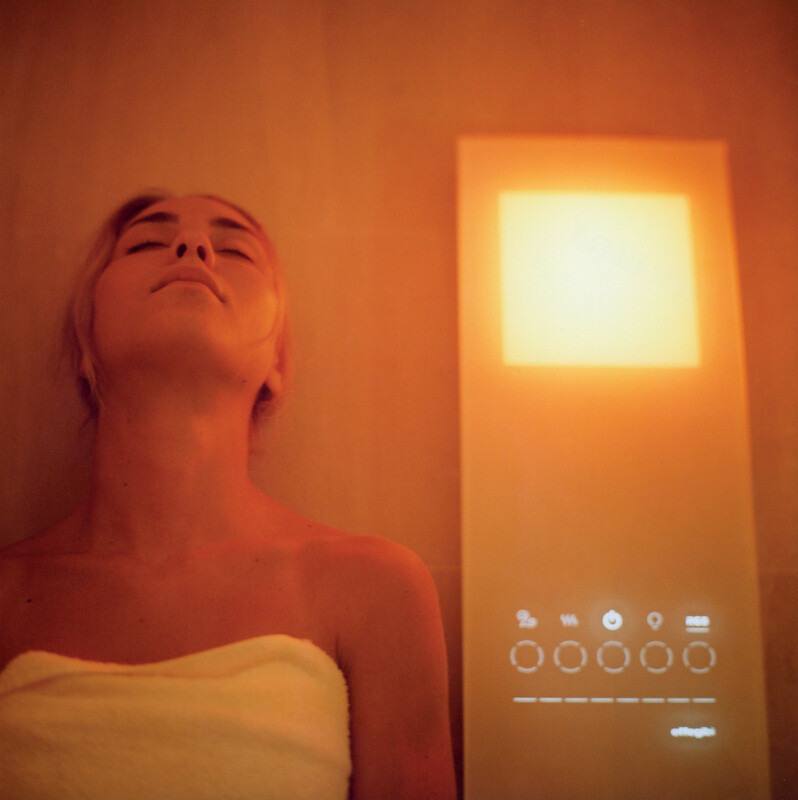 From lighting to aroma therapy and from steam density to music, they deliver in a compact form to transform environments into the perfect spas. Each utilize an intuitive touch screen that enables users to fully control their well-being. Nuvola Smart Power is the newest high-performance range of Effegibi steam generators, suitable for both professional and domestic use. The automated electronic management system is both highly sophisticated and user-friendly, designed to deliver the perfect Hammam experience. Combining ease of use with multiple functions to guarantee controlled steam output speed, longevity, low maintenance and energy saving. -ECC – Effegibi Comfort Control: This system is incorporated into every Effegibi steam generator so that the Turkish bath can be remotely controlled, just download the app Effegibi experience to your tablet or smartphone. Additional temperature probe inside the diffuser. With backlit icons and temperature gauge. Touch&Steams a stylish, lightweight professional-standard surface mounted steam generator that can be fitted to any environment set up to house a Hammam, from a home shower to larger spaces and also made-to-measure design. Complete with colour and aroma therapy. Backed up with technology that gives you maximum control over steam quality and density and hygiene. Low maintenance thanks to the automatic boiler-cleaning system that minimises lime-scale build-up unlike most steam generators on the market. Stylish, compact design featuring a panel of silk-screen-printed toughened glass, visible thickness 3.7cm. Plus the drip pan is already included in the product. 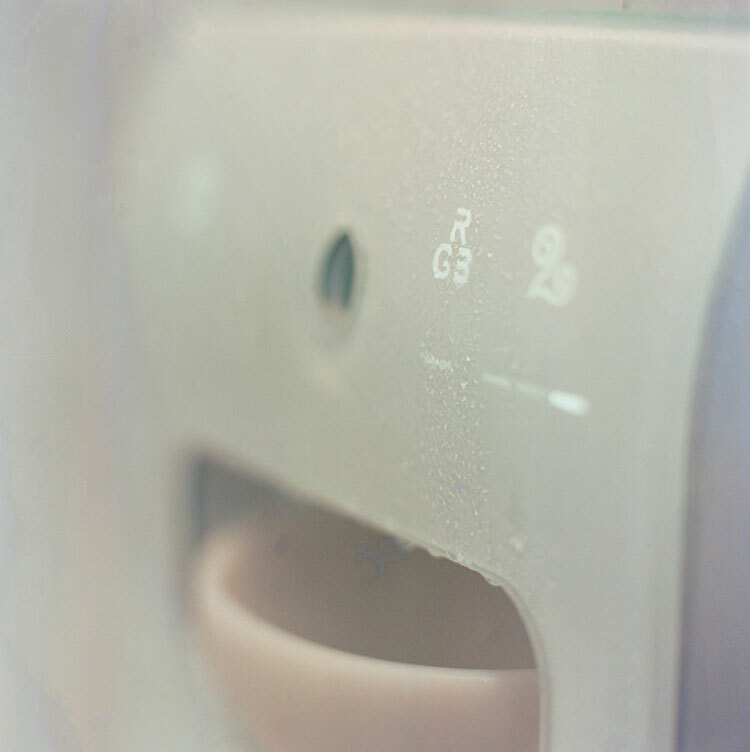 Effegibi’s ‘aquasteam’ offers the latest and most advanced heating options. By controlling steam output speed and longevity, the technology is packed into different sizes to offer great diversity and to cater for multiple scenarios. 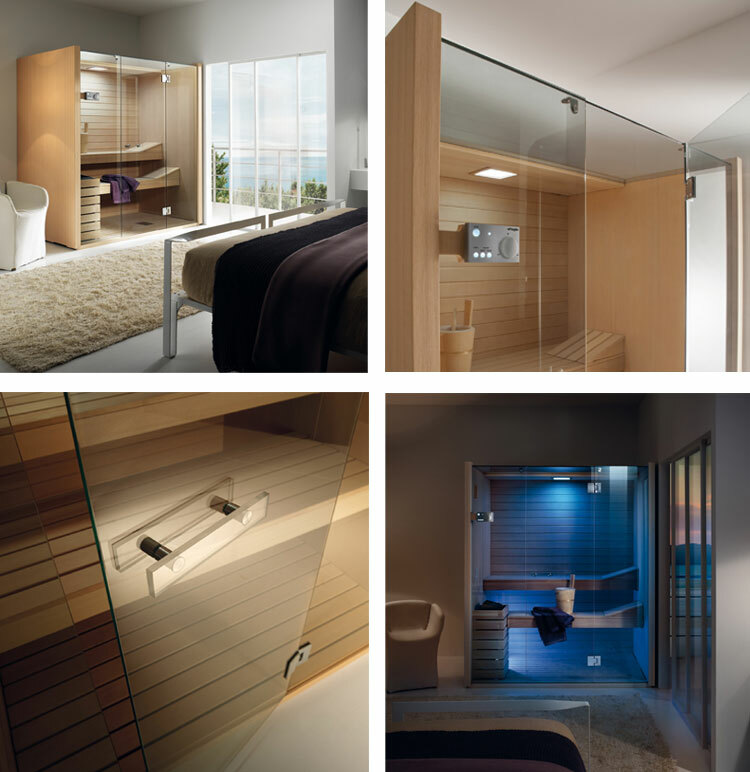 This enables their tailored spa experiences to adapt and function even when the smallest of spaces are required. This, as well as the color therapy options, can be controlled via a touch screen on the central column in the ‘logica’. Easysteam combines ease of installation with a hi-tech steam generating system with the Effegibi touch control. 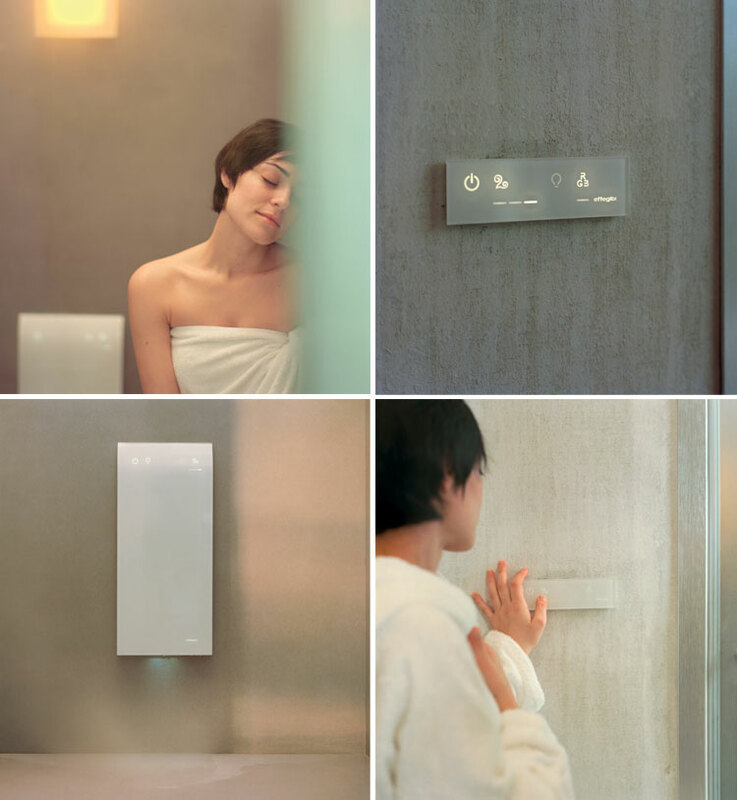 The control interface is a curved glass panel with back-lit icons for the steam generator housed in the casing which is fitted into the wall when the water system is made ready for installation. 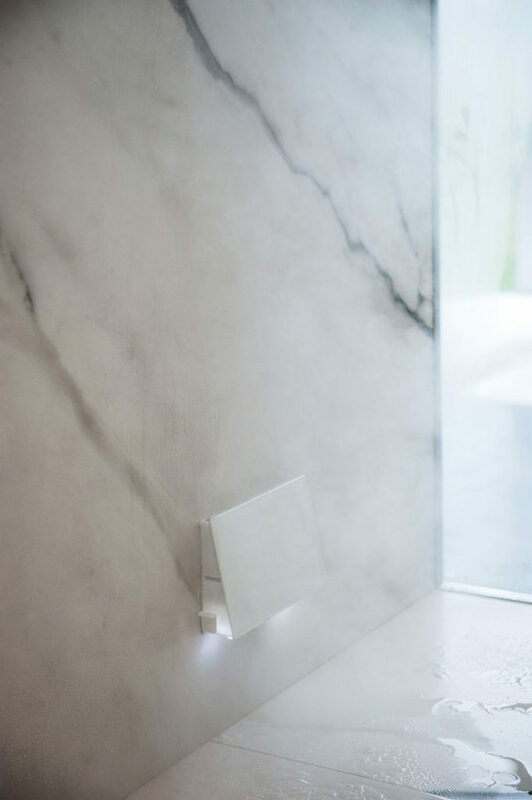 Simplicity itself to install and available in 3 and 4.5 kW versions, it transforms a shower cubicle into a high-tech turkish bath whose pleasures are at your fingertips, any time you want.